The Pokémon Company has revealed two new titles at the 2018 Pokémon Video Game Press Conference today, with the first being the free-to-start game Pokémon Quest for Nintendo Switch and mobile devices. Out now on Nintendo Switch and available in late June on mobile devices via the App Store & Google Play, the rambunctious action RPG developed by Game Freak takes place on the mysterious Tumblecube Island. With the help of three Pokémon, you'll be able to uncover the secrets of the island, while battling wild Pokémon, gathering treasure and even befriending new Pokémon along the way – provided you have the right treats to tempt them. You will also have the ability to decide the characteristics of your Pokémon and use special items called Power Stones to strengthen your team. The Pokémon featured in this title originate from the Kanto region and have a boxy, cube-like aesthetic. 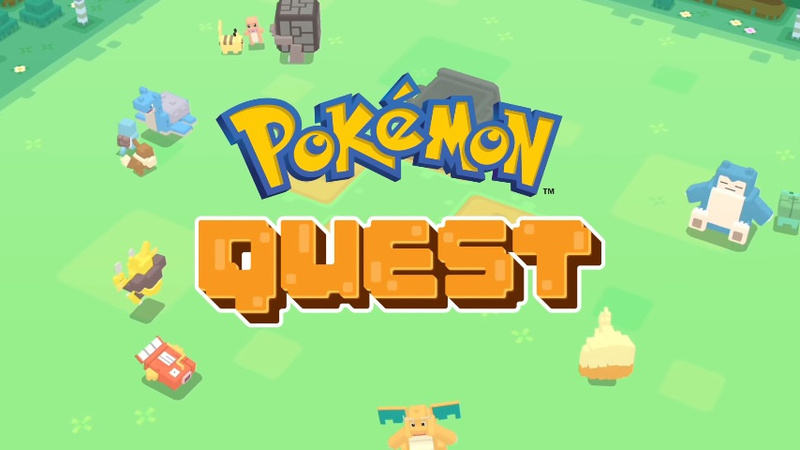 Battle by tapping—Pokémon Quest uses simple touch controls that can be enjoyed by everyone. Befriend many Pokémon—Use items collected throughout expeditions to befriend a wide array of Pokémon. Create your Pokémon dream team—Partner with three of your Pokémon friends to battle through diverse environments. Pokémon unique to you—Use different Power Stones to personalize your Pokémon friends however you want and give them unique stats. Customize your base camp—Decorate your home with cute and fun collectibles that not only look good, but can provide in-game benefits. Check out the trailer below and tell us in the comments if you are enjoying this new free-to-start Pokémon game. Link to the page w/ some pics but I can't find a vid. They missed out by not calling this "Pokemon Rumble Cubed". That's what we're calling it b/c that's what it looks like. Well it looks like "Pokemon Minecraft" but that name could be problematic. Free-to-start w/ $29.99 DLC. Also $4.99, $9.99 and $17.99. Edit: Game Explain made a vid, more to it than a Rumble game. Edit 2: Oh look there's a trailer in the article. I'd swear that wasn't there 2 minutes ago, but it's late and I'm gettin' old. Edit 3: If you click on the link above you can download it from the "Buy Now" link on the page. It says it's downloading to my Switch now. Nice to have Nitnnedo digital eShop working from my PC. You all have fun, I'm going to bed. @JTMnM Yep, it's on the way. I have hope it isn’t but I’m also terrified it is. Kinda looks like Pokecraft. Free to start isn't a bad way to dive in. So far this is kinda fun. Downloaded. Not a fan of the art style from the screenshots BUT... BUT... this is Nintendo afterall so it’s probably charming AF and I’ll probably end up loving it. Excited to try in just a bit! Beyond the fact that’s its Pokémon, I have no interest in trying this. If I want FTP I can do it on my mobile. Looking forward to more of these free-to-start titles coming to the eshop more. The free factor means that they can stay popular for a while (especially if the eshop gets some new features to expand on exposure) and paying for a game in chunks, rather than endless microtransactions, feels like a business system that's less easy to abuse or risk people getting hooked on buying them. Also curious if they'll reveal how the game performed on Switch compared to phones. The game itself reminds me of Pokemon Rumble in gameplay, though the party formations and control of attacks seem like they'll help distance it from that. This seems to be more something with optional additions that will make things go faster, so I'll check it out and see if it gets a bit too grindy without cash. Yeah, not even considering trying this out. I miss the days of Pokemon spinoffs that weren't freemium trash. This looks as a mix of Pokemon Rumble with Pokemon Mystery Dungeoun, but improved; however, the artstyle, well, It's not my favorite, but that's the least of it. But, Free to play style, hmm, it's something that makes me think, I already have some free to start games, and those consume time, add more serious very tired, well, I'll need to give it a try later. I actually find this to be very intriguing. After watching the trailer it looks much more involved than I thought. Can’t wait to try it out. @BenAV Pokken last year? Let's go Pikachu/Eevee! this year? @BezBot Forgot about Pokken because fighters aren't my thing so I'll give you that. The Let's Go games are more of a remake than a spinoff though I think. And I hate that more than the freemium games. It's a full retail game that is heavily linked to a freemium mobile game. No thanks. Can I play the same account on Switch and mobile? If so, sign me up! Congratulations Nintendo for turning Pokemon into a cash-cow again. Now where's my Pokemon MMORPG? Looks pretty horrible. I'd stick with the Pokemon Minecraft mod. I excitedly downloaded this and then quickly became disappointed. You don’t even get to move your group around, dang. @Anti-Matter It is/was a popular mod of Minecraft on PC. Just played the first few missions...and as someone who actually enjoyed Shuffle and Rumble World quite a lot...I can easily say that this one just doesn't cut it. @BezBot looks like the are on the slippery slope, i hope the core game will be amazing because this was disappointing news to say the least. Does anyone actually use the touch screen? I just played for about an hour, terrible mobile freemium game, avoid! I did not buy a dedicated gaming console for this utter trash! @bolt05 Its a free game, its not like you paid for it and its not like its the only game you have to play. There are hundreds of other options to choose from, if you don't want to play a game you have to spend no money for then fine. Cause i'm fine with any free games we can get. Well, I can't wait to get home to play it. Erm... yeah just another reason to put my Switch on eBay and then probably just get the new model in second half of 2019. @patbacknitro18 I think its trash. Enjoy if its your thing. Tried it for 2 hours. Looks like a fun typical free to play experience. Might start it up Now and again for some short plays. Not bad for a price of totally free. @bolt05 Of course hate it if you like. But don't pretend that this 1 free to play game is ruining your "Dedicated Gaming Console" Experience when there are hundreds upon hundreds of other games for you to buy and play. You bought the system for those games, you're not forced into this game. Looks kinda garbage--but thankfully the Pokemon Let's Go games look sweet (just as I imagined a traditional Pokemon game on Switch looking actually)! @impurekind Makes me wonder if they are gonna use the same assets from that game. Because they confirmed that Pokemon Switch was in development before the Switch was even announced. So could Pokemon Lets Go have borrowed the assets from the new Pokemon Game? Or will the new game have its own style thats an upgrade of Pokemon Lets Go? Looks totally crap. But its free, so I'll try it. 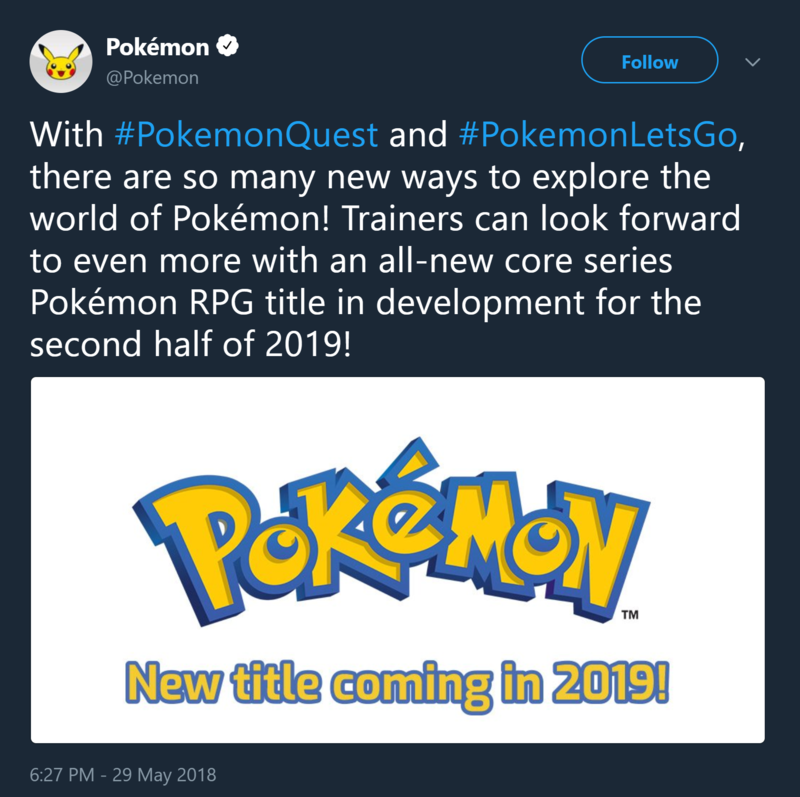 @patbacknitro18 Well, I was honestly just kinda hoping the brand new Switch Pokemon game would basically be what we've now got with Pokemon: Let's Go, so I half expect it to be a step up from that in some ways, maybe in terms of a slight visuals upgrade but possibly in also going for a more open-world-ish, fully 3D in terms of the camera view(s), and over-the-should 3rd person adventure too. Whatever the new game is, I'm already pleased with what I've seen of even just Pokemon: Let's Go, Pikachu! thus far--so I'm a pretty happy camper! Already downloaded it, I’ll try this later today. Is there a limit like with Rumble, that if you spend 30 bucks, you get rid of the F2P crap and get some kind of ingame cash generator. Otherwise I'm not interested, as I hate F2P with a passion, since it always end up being way more expensive then the typical standard Pay to Play game. @Yomerodes @Pablo17 Well that doesn't bode well. I thought this was the next evolution up from Rumble World w/ a bit of Puzzle & Dragons creature management added in. It just has to be better than Rumble U, that game was such a disappointment. I'm ignoring the guy who called it freemium trash b/c if you're calling it that well you probably aren't giving it a fair shot. Guess I"ll go play it after breakfast and see for myself. Downloaded last night for the kids who are at school. Not a big Pokemon fan but Rumble World was one of the better free games I've played. This is #1 at US eshop! Is really fun. @patbacknitro18 i never said it was ruining my experience. I said I didn't buy a console for this trash. You're adding words that weren't there. I also think you're lashing out because my opinion of this game is negative. I think this game highlights the shovelware kingdom that the switch eshop is fast becoming. If it's tending towards a mobile freemium store front now I don't think that's good, I think it's very bad. @bolt05 It's not hard to see your implications given that this is a free game and you have nothing forcing you to play it. If you don't like it then that's fine, but don't pretend that this 1 game "highlights the shovelware kingdom that the switch eshop is fast becoming" Since this is maybe 1 of the 5 free to play games on the system out of the hundreds you could pay for. And why is freemium gaming bad? The Switch Eshop isn't going to become anything but Freemium games since only 5 games have come out as free to play in the past year. Meanwhile, you still have hundreds of games from Indie Developers and 3rd party companies. So 5 free games coming out per year is not a bad sign. Especially if that means we can get free to play games like Fortnite or Leauge of Legends. To me, both this and Lets Go strike me as something they quickly threw together to appeal to the younger crowd to bring in some new fans, and as something to keep people occupied until the next major entry comes out in 2019. Too bad this isn't a game at all. Nothing like watching things unfold with no control over anything except occasional special moves. At least in Rumble you could control your characters, much better free game than this. Woah! I downloaded it already and it's the best Pokemon game ever! @CheepCheepAngler "something they quickly threw together"
While I was playing Pokemon Quest yesterday I did refer to it as the Animal Crossing: amiibo Festival of Pokemon games.